Our regular coastal breeze had failed. Strong winds from the north-west brought heat from Australia’s desert regions. Temperature in the shade rose to 44C. Away from the coast, temperatures rose higher and in Australia’s centre birds were seen to fall dead from the sky. The extreme weather meant fires were ravaging many areas. The smell of smoke hung in the air giving ominous warning. 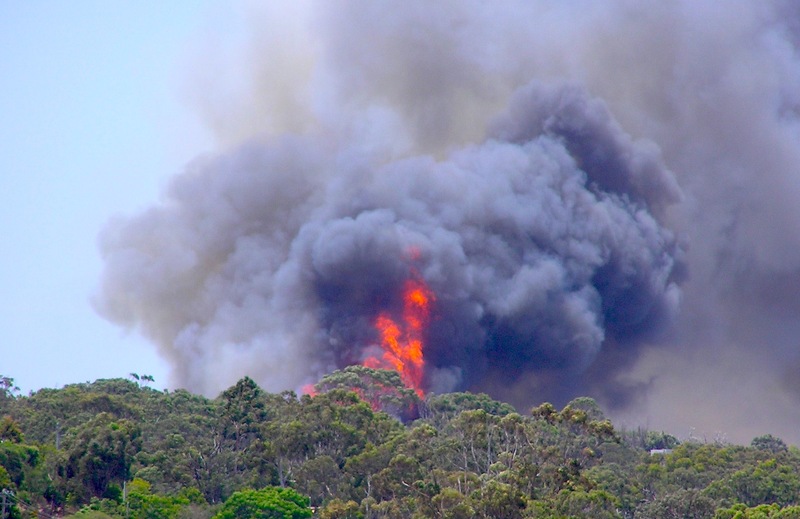 An emergency alert warned a fire was five kilometres distant. Checking wind direction, I knew my house was safe but friends were in its path. A new day, winds and heat less, my friends were safe… at least for now. “birds were seen to fall dead from the sky” – that’s chilling, and judging from the news stories it sounds as if it’s probably true. So awful. But you describe it well. Yes, the bird part is true. Way out west it was approaching 60C in direct sunlight. Budgerigars were trying to find any shade for protection. Locals saw some fall from the sky because of heat stress. So frightening! However, the writing is wonderful. The photo was taken from my house of a previous fire. The one described was more distant. The friends mentioned operate a wildlife refuge. Thankfully the fire passed around their refuge. Almost all animals had been evacuated before the fire hit. No animals or lives were lost in this one but their has been a number of tragedies in other areas. Hard to imagine heat like that; we really don’t have it so bad in the UK. My first permanent teaching position was in a small, isolated school in western New South Wales. I recorded the temperature of 47C in the shade for two weeks running before we had a cool change. Children didn’t venture from shade except when they had to. I suspect a frying pan left in direct sunlight would have been hot enough to cook an egg.